In old days during the Spring Festival holidays, children usually kneel down and touch their foreheads to the ground before they are given a red envelope containing cash from older family members, and nowadays employees have to work exceptionally well in order to be handed a red envelope from the boss at the company annual meeting. This year, however, many found a new way to spread the red envelope with the wish for luck: handing red envelopes electronically via smartphones. Tencent Holdings, China's largest Internet company by revenue, launched a "red envelope grabbing" function on January 26 for users of WeChat, the company's highly popular instant messaging smartphone app. The function allows users to send virtual red envelopes containing cash either to a specific person or a group of friends, among whom the money would be randomly divided. Tencent's biggest rival, e-commerce giant Alibaba Group, launched a similar function on January 24 on the firm's online payment service Alipay, which allows its users to claim virtual red envelopes from others. However, Alibaba's efforts appear to have caused a much smaller fuss than Tencent's. While some observers said Tencent's successful red envelope campaign could give the company a lift in surpassing Alibaba in the online payment service arena, analysts told the Global Times that the WeChat operator still has a long way to go. Tencent's red envelope function gained considerable popularity among the 600 million WeChat users around the world. More than 8 million users participated in Tencent's "red envelope grabbing" spree and more than 40 million envelopes, each containing 10 yuan ($1.65) on average, had been claimed from January 30 to February 7, the Xinhua News Agency reported Monday, citing data provided by Tencent. In fact, the activity seems to serve a greater goal for Tencent than just adding some fun to WeChat users' Chinese Lunar New Year celebration: It helped the company nurture a customer base for its online payment services. Tencent has been trying to fight Alibaba Group in the online payment arena for about a year. However, as a latecomer, Tencent's payment service and online fund product had been lagging way behind its competitor in both number of users and transaction volume. By requiring the WeChat users to link their bank cards to their accounts before allowing them to send or claim red envelopes, Tencent had the chance to attract millions of new potential users to its payment service, Lu Zhenwang, founder of Shanghai Wanqing Commerce Consulting, told the Global Times Monday. Tencent has not released a figure for how many WeChat users linked their bank cards with their accounts because of the red envelope feature, but Reuters cited a Standard Chartered Bank research note saying that the company may have gained 30-100 million new payment users thanks to the function. Lu said the red envelope feature is an "extremely successful" strategy for WeChat to grab customers from Alibaba's Alipay online payment service. "The feature will attract a dramatic surge in the number of WeChat payment users since it creates an incentive for them to explore functions such as taxi hailing and online fund products," Lu said. Jack Ma Yun, head of Alibaba Group, reportedly said that Tencent's red envelope feature is like a "Pearl Harbor attack" on its Alipay online payment service. According to Alipay's Weibo entry, 55 million yuan in red envelopes were sent out on chuxi (Chinese Lunar New Year's Eve), which falls on January 30, with approximately 1.1 million people using the feature that day. Tencent, in comparison, reported that 4.82 million people sent or claimed red envelopes on WeChat on chuxi, with each envelope containing 10.7 yuan on average. About midnight January 31, the company said, some 250,000 virtual envelopes were claimed every minute. Lu said WeChat's feature was causing more of a buzz because it is a social platform. That makes it easier and more sense for users to send and claim red envelopes, which is a social activity itself, he said. Zhang Meng, an analyst with Analysys International, told the Global Times Monday that WeChat payment will not surpass Alipay in popularity in the near future, though Tencent's red envelope feature was a success. "The application of WeChat payment is very limited compared with Alipay," Zhang said. "While Alipay can be used to buy products on taobao.com and pay for telephone bills, gas and electricity, WeChat payment only supports a few functions such as online funds and taxi hailing, which can be done on Alipay as well." Kai Ge, a consultant with the Beijing office of a consulting agency, told the Global Times Monday that he enjoyed sending and grabbing red envelopes on WeChat, but will not use WeChat payment. "I have 2,000 yuan on Alipay and I see no need to switch to WeChat payment simply because I had fun grabbing virtual red envelopes," he said. Ge, who sent out 200 yuan of envelopes "for fun," did not claim any cash he received and plans to unlink his bank card from his WeChat account. "I'm not comfortable having my WeChat account, which is primarily a social tool, linked to my bank card," he said. "I have safety concerns." 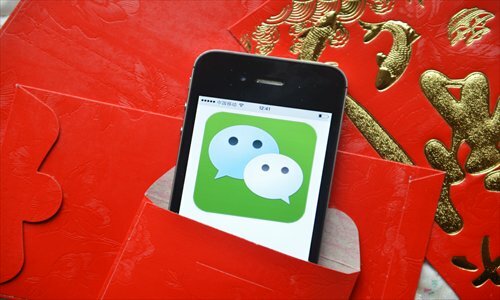 In fact, safety issues pertaining to WeChat's red envelope feature did bother at least one of the users during the holidays. A writer surnamed Yu said on her Weibo that she got a link from a friend on January 31, which she assumed was a red envelope from him. After opening the link, however, she found that it led to a list recording the friend's sending and receiving of red envelopes from others. She posted the issue on Weibo where Tencent responded it was an extremely rare case and they would make technical checks to ensure it did not happen again, she said. No users have reported any safety glitches with Alipay's virtual red envelopes as of press time. Established in 2004, Alipay has more experience in dealing with safety issues of online payment systems than Tencent, according to analysts. Lu said that Tencent should try to avoid head-to-head competition with Alipay, and focus more on fulfilling social network-based payment demand. "The red envelope is a smart campaign dependent on the huge social networks that Tencent manages," Lu said. "Therefore, the company should innovate on how to use the relationships of its WeChat users and fill the need of social-based online payments."